Night of Stone is a book for deep and dark December, and an amazing work of history. Carrying the subtitle “Death and Memory in Russia,” it focuses on the twentieth century, when there was more than enough of the first, and the second existed under the particular pressures of the Bolshevik revolution and Soviet governance. Merridale started by looking at the rituals surrounding death as a way of understanding the extent of revolution in Russia, but she followed where her questions led, and found herself writing a much deeper, much more heartfelt, and much more tentative history as a result. The scale was indeed immense: more than 50 million lives lost “between 1914 and 1953, to violence, famine and epidemic disease. Half of these deaths were the result of the Great Patriotic War alone.” (p. 14) The upheavals of the twentieth century were hardly the beginning; Merridale notes that the famine of 1891 was one of the most terrible of the Tsarist era, causing millions of peasants to die of starvation. A further aspect is the Soviet government’s response, “which was to suppress most information and to deny loss. … Although there was a devastating famine in 1932–33, for instance, affecting tens of millions of people and accounting for at least five million lives, the words ‘famine’ and ‘hunger’ were banned from press reports within the Soviet empire in the 1930s. The post-war famine of 1946, when tens of thousands starved, was scarcely reported at all. … Statistics relating to demographic loss were doctored of kept hidden. An entire census, in fact, was locked away in 1937, and the officials who knew its secrets were arrested and shot.” (p. 15) Merridale never loses sight of the individuality of each individual death. Though people perished in their millions, each was a life like no other; each person was born to particular parents, lived a life that no one else lived. She deals with the large scale, and how death in such magnitude is qualitatively different for the shape of a society, but she never succumbs to Stalin’s views about tragedies and statistics. (It was the most interesting technique she had ever witnessed. She wouldn’t even have thought that it was technically possible. (Bill Door [Death’s pseudonym] regarded the neat row of stalks for some while. (NO. NO. ONE BLADE AT A TIME. ONE TIME, ONE BLADE. (“You won’t cut many that way,” said Miss Flitworth. (EVERY LAST ONE, MISS FLITWORTH. “While I started with an idea about revolutionary culture, then, I have ended up with an investigation into mass mortality and survival.” (p. 16) The earlier chapters of her investigation reach back to the late 1800s, as she lays out the ritual and practice in pre-revolutionary Russia, and those parts of the book are based mostly on documentary evidence. As the history moves toward living memory, she draws more and more on interviews. But interviews are necessarily with the people who have survived, and for vast swathes of her subject there were no survivors. Merridale has to listen to the silences, to know where they are, to know why they are, to consider what might fill them, and whether anything can be said at all. The silence echoed in both official and unofficial events. The Soviet census of 1937, which would have revealed the extent of the deaths, was an example of the former. The government had engaged 130 thousand instructors to supervise the enumerators; it had produced two million copies of an informational pamphlet in 29 different languages; they aimed to count about 40 million households. “For the results of all that counting and discussion were never published. Forty-eight hours after the census had been taken, before the purple ink on all the forms was really dry, an official with the task of analysing the data wrote to his chief, Kraval, in Moscow. ‘The results of the census,’ he insisted, ‘judging by the preliminary data, render this material absolutely secret.’ The men in the National Statistical Office had already reached the same conclusion. 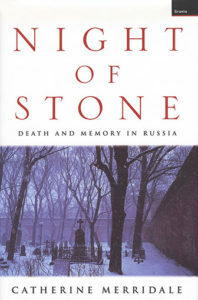 '” (p. 197) Night of Stone concentrates on Russia; the worst of the 1932–33 famine was in Ukraine, where it has become a national symbol in the years since independence. That has added a layer of meaning to recollection and mourning in Ukraine. “In Russia itself, some parts of which saw equally appalling hunger, there is no real structure for remembrance even now. And in Kazakhstan, where in 1929 city-based officials drew up plans for settled, fenced and scientific agriculture, thereby condemning millions of traditional nomad herdsmen to starvation, there is hardly any memory to rouse. The survivors scattered, changing their identities. The steppe is strangely empty, and the semi-desert grassland bears no scars.” (p. 199) The silence rings on. Merridale also spends a significant part of this chapter on the story of Anna Timofeyevna. When she was seven, men from the state came and took her father away, saying he was a kulak. “The fact of her dekulakisation had been a shameful secret for decades (it could have meant the loss of her career). It was a past that she had hidden, skillfully, for fifty years. Much of it was buried under later triumphs, and some of it was still disguised within the prejudice and superstition that are part, despite the Bolsheviks and their science, of every Soviet person’s heritage.” (p. 224) Anna, her mother, and her three brothers “were herded into a barracks and abandoned without papers or money.” (p. 224) They were nearing starvation, but somehow managed to get word to an aunt, who was married to a musician in the city; the couple had no children. They arrived with some supplies for the family, and an offer to take one child back with them. Anna went. “She had rickets, and at seven was almost as tall as she would ever grow.” (p. 224) For two years, she was too ill to do any work. As soon as she was able, though, she started taking musical and circus performance lessons — in addition to school — from her uncle. During the war, she and her uncle played 124 concerts in a month. Later, she married the only accredited artistic whistler in the Soviet Union. “Whenever you heard whistling in a film, it was him.” (p. 226) He made 85 films. “As soon as she was old enough, Anna Timofeyevna became a member of the Komsomol, the Young Communists League. She went on the parades, she wore the badges, she joined the class struggle on the winning side. In truth, as her uncle no doubt realised, she probably would not have been able to perform in public if she had not. Her stage career began at a time when the Communist Party’s grip on public discourse of all kinds had become a stranglehold. But she did not make an effort to disbelieve. An optimist, a comrade, a keen member of any team, she built her world within the grander myth of socialist construction, dauntlessly adding whatever she could to the collective victory over Fascism, and always working, working because work had been her path to life, working to contribute and belong.” (p. 228) Silence about her origins from the time she left the village until the fall of Communism was part of the price of her survival. Her mother remained there. Her father, improbably, returned from imprisonment and forced labor after only a year. “He began to drink — there is no other description of him than that — and he died ‘within forty days. '” (p. 229) During the time of great hunger when the aunt and uncle took Anna, her youngest brother disappeared forever on a day that the mother was searching for food. Anna says she believes he lived, but the family never saw him again. The middle brother got sick in 1940 and died within a day. The oldest brother fought in the Finnish War; he fought in the Great Patriotic War and survived. He became an army officer and fathered two children. In 1959, when he was 37, he died in a training accident with a grenade. Merridale’s account covers much more than just these crucial years and hinges of historical experience. She begins with the customs of mourning and burial in Tsarist Russia, how these shaped the lived experience of most of the empire’s residents, how encroaching modernity was beginning to change them when the Great War and the Bolshevik revolution upended everything. At the other end of the era, she talks about what persisted into the Brezhnev years, how the Soviet attempts at new rituals never fully satisfied people, and how they improvised their own ways of making meaning out of death and dying. That process continued into the glasnost years, when the enforced silences of previous decades suddenly ended, replaced by a deluge of words. With that era now nearly a quarter century in the past, it would be interesting to see which silences have returned under a regime that seeks to restore at least some of the old verities. One of the strengths of Night of Stone is Merridale’s willingness to be present on the page. As she gave talks during the writing of the book, some of her students asked her whether she should not have been more detached. “I started with some hypotheses, most of which have turned out to be misapprehensions. They concern the notions of individual trauma and brutalisation; the work of testimony; the processes of cultural continuity, memory and change; and the meaning of the dead.” (p. 414) She could have been more detached, but then she would not have been nearly as brilliant.